-Everything done on this car was done professionally and have all documentation & receipts of everything done to this car. -6.0 L Iron Block, Wiseco Coated Pistons, Lunati Pro Billet Rods, Callies Compstar Crank, Whiplash Cam, Dual Patriot Springs, Built Cylinder Heads with Ferrea Intake/Exhaust Valves (handle 30+ lbs of boost), Billet Harmonic Balancer, ARP Bolts and Studs, LS6 Intake with Ported Chrome Throttle Body. -APS Twin Turbo Kit, Upgraded Turbos (650HP Each), Upgraded Turbosmart Blow Off Valves, Upgraded Turbosmart Billet Wastegates, Controlled by a Turbosmart Eboost Electronic Boost Controller. Currently running 9 PSI, Current Setup with do well over 20 PSI. -Fuel Lines, Coolant Lines, Etc. are either steal braded or high temp hosing. 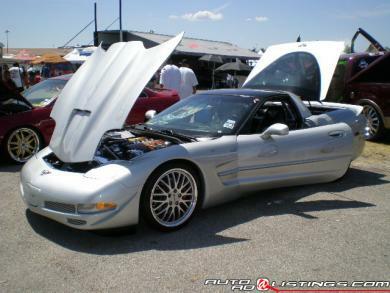 -Custom Painted Silver with Ghost Bullets on side and hood of car, Custom Shaved & Airbrushed C5 Corvette Logos on front and rear of car, rear lower exhaust area, rockers, and underneath front bumper painted flat black. - RK Sport Ram Air Hood, Brush Aluminum Gas Door, Billet Front Bumper Grills, ACI Rear Spoiler & Front Winglets, Chrome Tail Light and License Plate Bezels, Red LED Tail lights, Tinted Glass Top, Much More! -Custom Double Din Dash Bezel, Console and Dash Pieces-Painted Silver, Accomodate Pioneer AVIC-F700 Double Din Unit, Turbosmart Boost Controller and Custom Spray Bar Kit Panel with ECS Methanol Kit Controls. -Custom Airbrushed Seat Bezels, Billet Seat Levers, Painted Door Handle Bezels, Chrome Door Sills, Chrome Door Strikers & Bezels. -Custom Speaker Pods in doors to accomodate 6 1/2 Speaker Component Set. -Soundstream Tarantula Series 6 1/2" Component Set with Two Tweeter in each door. Over $100K Invested in this car. I'm selling to start another project. Everything has been done in the last 1 1/2 year and practically everything on this car is new. I am included a stock C5 hood (silver), binder with all documentation, custom fit car cover and other misc new parts I haven't had time to put on the car yet. Car has 90K miles on it, all upgrades including motor has 5K miles or less. I have all documentation and receipts on this car. I am the 3rd owner and have history of the last two owners. Car has never been drag raced or abused; and is always garaged kept. It drives and rides excellent on the road. Very dependable and with all these engine modifications the car still gets 24 MPG! This is showcar ready or perfect for that weekend driver! Payment Methods: Cashiers Check or Bank Wire Transfer. I will release the car, title & all documentation of the car once the funds have cleared. Buyer is responsible for Pick Up or Shipment of Vehicle. I will assist in anyway I can to make the transaction go smoothly. Title is free and clear; and on hand to sign over! Asking $44,900 OR BEST OFFER! Please Feel Free to contact me on here or call 832-797-1564 for any questions, I have tons of more pics or will be happy to take some for you.